These tasty treats are also well known as Russian Tea Cakes and Mexican Wedding Cookies. 1/2 cup Powdered sugar, sifted. Put butter and powdered sugar in a mixer with a paddle attachment, and cream them together until smooth. Add the pinch of salt and vanilla extract and mix. Slowly add the flour until the dough comes together. Now fold in the toasted pecans mixing well. Let dough chill for 1/2 hour in fridge. Roll the dough into small balls and place on a parchment lined or sprayed baking sheet. Bake at 350 F until cookies are golden brown about 12 minutes. When done remove from oven and let cool. 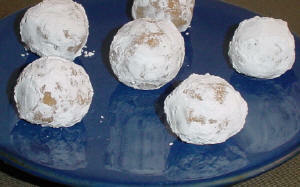 After the cookies are cool roll them in sifted powdered sugar to completely cover each cookie. Enjoy.